People said that it gets hot here. I thought that I understood hot. “I’ve lived in hot places before”, I said to myself. Sure, Sacramento gets pretty warm in the summer. Maybe one or two weeks of 100+ weather in August. But never have I experienced anything like this. In January, we had snow one week and 70 degree weather the next. By February it was in the 80s, March and April in the mid-90s. By May, we had our first 100 degree day, and I suspect that it has only dipped below 100 briefly a couple times since. The house AC has been running constantly, I’m scared to open the power bill every month, the lawn is dead (we’ve had just over 4 inches of rain so far this year), and I pretty much hide indoors anytime before midnight. I guess the good thing is that unlike last August, when we first moved to Austin, the temps have been dipping down into the 70s at night. I remember when we first moved here, it was 100+ during the day and 95 at night. Previous PostLutowanie Jest Proste (Soldering is Easy – Polish Translation)Next PostTwo weeks to Chaos Camp! 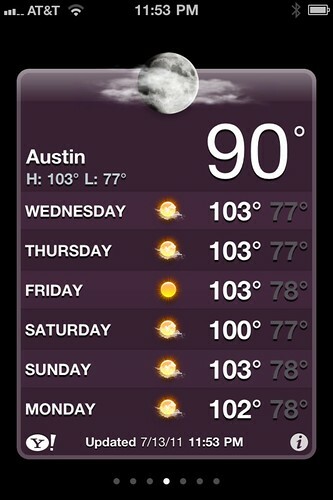 I’ve been in Austin 11 yrs now and have never seen a summer this bad. We’ve now spent nearly 1/4 of the year over 100 degrees! I can’t even remember what rain looks like. Two years ago I remember my parents coming up to visit in early spring. The day they arrived we sat on our back patio in shorts and t-shirts sipping tea and enjoying the afternoon. It was about 80. The next day the temp dropped to the 20s and that night it started snowing. It snowed for two days dropping about 5-8inches of accumulation. The day they left it got up to 40. The next day I was walking into wal-mart dodging gigantic melting snowpiles in flip-flops, shorts, and a t-shirt. It was in the high 70s and low 80s. The strangest part is, as much as my parents and I were completely bewildered by the strange weather, the people here were taking it totally in stride. Typical winter weather for these parts…. how bizarre. But I feel your pain. We’re in the 100s everyday in Tulsa which IS strange for this region. So far the hottest summers in recent history and building up to be on of the hottest ever. I’ve lived in Austin for fourteen years and in Texas all of my life. I’m still not used to the heat. This summer is irrationally hot. Just wait for August. That’s when it gets worse. Make sure you have the phone number of your air conditioning service company at hand. You don’t want to know what it is like to spend 1 week with a broken compressor unit.